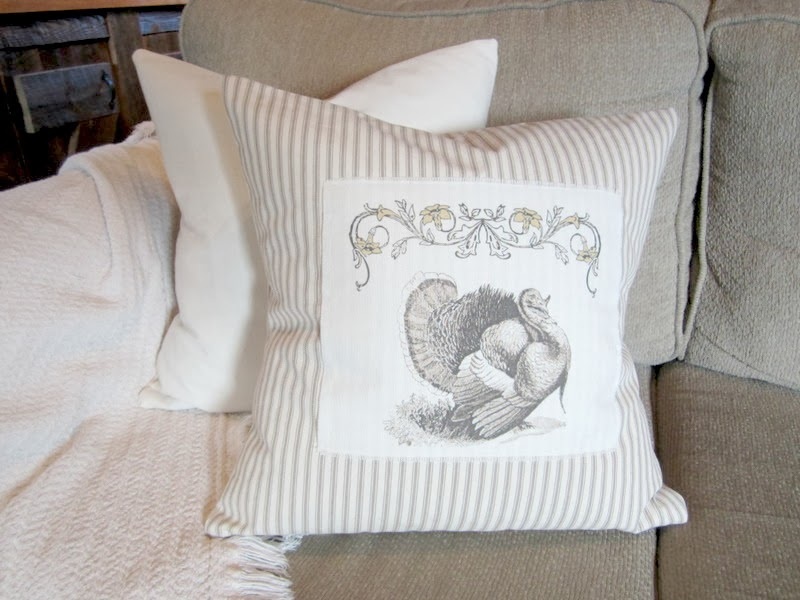 Who doesn't love changing throw pillows for each season? It's such an easy way to change up a room. They can quickly add pops of color or seasonal accents. I'm loving the way a few throw pillow covers I made this week turned out! ... I have a tutorial ready on how I printed these vintage images directly onto fabric, using freezer paper and my home printer. I chose a creamy white piece of cotton that has a natural duck cloth look with flecks of tan in it. The images show up great on it and it matches the ticking fabric that the covers are made from. 2nd step - cut a piece of freezer paper the same size as your cut piece of fabric - slightly larger than your printer paper. 3rd step - lay the side of the fabric that you want the image printed on facing down. Lay the shiny side of the freezer paper onto the fabric and iron over it until it adheres to the fabric, making it one piece. 4th step - trim your fabric paper exactly to the printer paper size 5th step - lay your fabric paper in your printer tray. Make sure the fabric side is facing the correct way for your printer to print on it and not the freezer paper side. Now you are ready to print the image of your choice onto your fabric. I found that the fabric fed into the printer better without additional paper in the tray. I did have some trouble with the fabric feeding through. It jammed, didn't feed through quick enough and only printed 1/2 of the image and sometimes it just wouldn't feed at all. Obviously, I did have successes too! Your image is ready to be sewn onto a pillow cover, a tote bag or just framed in an embroidery hoop or picture frame. You could even create smaller images to use as fabric tags to tie onto gifts or baskets. I'm sure I'll be trying other projects using this printing method. I'm super pleased with how detailed the images printed and what they add to the pillow covers! I adore your ticking pillows, dear one!!! 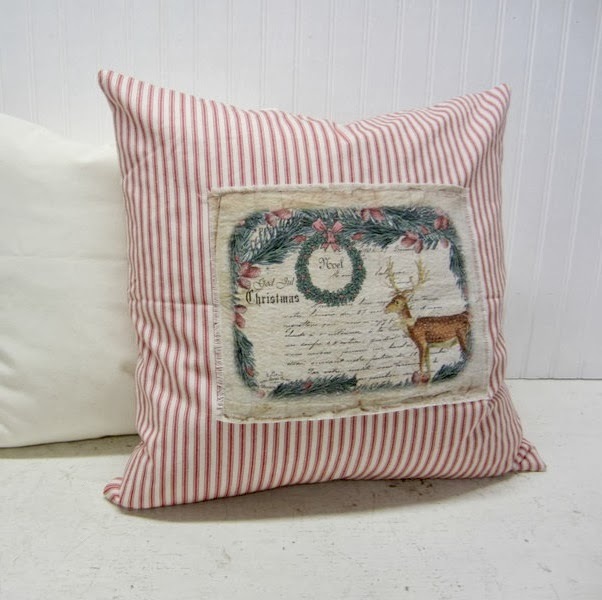 This Summer, I made a ticking pillow using vintage buttons!!! 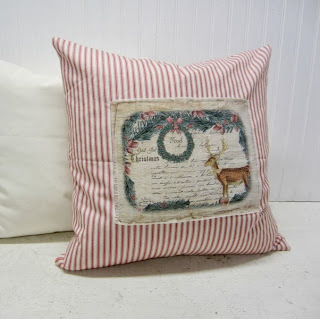 Thank you for sharing these lovely Seasonal pillows with us!!! Don't you just love ticking fabric! Thank you so much for your kind words, they made my day! Adina this is so awesome. I really enjoyed this inspirational post. I would love it if you would share this post at our What’s It Wednesday linky party? Hope to see you there! Love the idea of the freezer paper. i usually tape the fabric on a sheet of paper. I will be interested if someone comes up with the answer of how to make the printer permanent. The freezer paper worked great! I'll definitely write a post if I figure out a way to make the ink permanent. Jennifer - thank you so much. 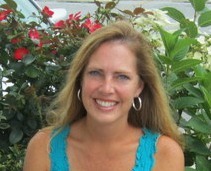 I've been enjoying your party and your blog! Looks so cozy and inviting for the holidays! Wildly Original link party every Wednesday evening. Beautiful Pillows! I believe the labels are better because it cuts out TWO steps! cutting the freezer paper and ironing it. :) I'm a lazy DIY'er.